The Conference of the Birds, also known as The Language of the Birds is certainly the most celebrated work of the twelfth-century Persian poet, Farid al-Din Attar. It tells the story of a flock of birds that set out to seek their king and god, the Simurgh. Only thirty of them survive the perilous path, on which they traverse seven dangerous valleys and reach their ultimate destination: a lake. There they see their image mirrored in the water and recognize themselves as the very god they were seeking.This mystical poem clearly lends itself to numerous interpretations and, even if the author is not himself a Sufi,, the tale is full of Sufi references and meaning. For anyone inspired by celebrations of St Valentine’s day, Persian literature has much to offer. Whether it be platonic adoration, romantic affection, or star-crossed disappointment, Persian poetry, in particular, has something to say about it. 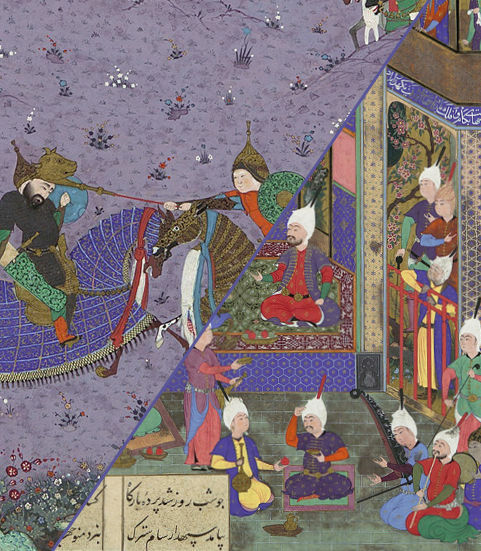 With a written tradition stretching over a millennium, much of it still preserved in manuscripts; we explore here a few select examples of epic and romantic compositions from the British Library’s growing collection of digitised Persian manuscripts available online to observe wonderful and alternative responses to love, physical and spiritual. Purchase advance tickets to avoid waiting in admission lines. Exhibitions are free with Museum admission. For centuries, Persian kingship was epitomized by two complementary pursuits: bazm (feast) and razm (fight). The ruler’s success as both a reveler and hunter/warrior distinguished him as a worthy and legitimate sovereign. The pairing of bazm and razm as the ultimate royal activities is an ancient concept with roots in pre-Islamic Iran. It is a recurring theme in the Shahnama (or Book of Kings)—the Persian national epic—as well as other poetic and historic texts. This exhibition will feature some three dozen works of art in various media, created between the fifteenth century and the present day. Works from the Museum’s Department of Islamic Art that illustrate the linked nature of bazm and razm will be displayed alongside corresponding works—primarily Persian—from the departments of Asian Art, Arms and Armor, and Musical Instruments. The exhibition will chart the gradual shift in meaning and usage of this pairing as it emerged from a strictly royal, or princely, context and became more widespread. When a 20-year old Iranian art student moved to New York in 1944 from her hometown, the ancient city of Qazvin, she soon found herself mixing with the brightest players on the city’s art scene including Willem de Kooning and Andy Warhol. John Cage crowned her “that beautiful Persian girl”. But the work of Monir Shahroudy Farmanfarmaian had a different source, not in Warhol’s Factory or Manhattan’s Studio 54 nightclub but beneath the crystalline high-domed hall of the Shah Cheragh mosque in Shiraz, southern Iran. There, she had experienced in 1966 a transformative encounter she compared to “walking into a diamond in the centre of the sun”. The first museum survey of Farmanfarmaian’s work isolates the past 40 years from an illustrious and lustrous career. Not only does it showcase a wealth of material, it highlights recent forays into moving sculpture and painterly works on paper that suggest fresh potential in an artist who is now 90. Infinite Possibility – Mirror Works and Drawings 1974-2014 is presented at the Serralves Museum of Contemporary Art in Porto this winter. Curated by the museum’s director, Suzanne Cotter, the period of her career covered by the show reflects Farmanfarmaian’s complete adoption of abstract geometry, a genre she made her own in the 1970s by translating it into three dimensions via mirrored sculptures and reliefs. The show presents the artist, who signs her works simply as “Monir”, as a prolific and interdisciplinary figure. Passing visitors to Serralves will be drawn in by the aesthetic majesty of the riches on display; on the surface alone, the dazzling lustre of this period of Monir’s work is hard to resist. But beyond the glittering surface lies grit: in her practice as an abstract artist, Farmanfarmaian was and remains a pioneer both as an Iranian and as a woman – the most celebrated, and perhaps the only, contemporary artist working in mirror mosaic. Seeing Farmanfarmaian’s work exhibited at Doha’s The Third Line gallery in 2013 prompted Cotter to bring both Monir’s sculptures and sketches to Porto. The artist later thanked Cotter in an interview with Artforum, the international magazine, for “being the first to notice that my drawings were something different and deserved a special focus”. Cotter wants the sketches to be seen as abstract compositions in their own right, not merely as preparation for three-dimensional works. Most of the material included in Infinite Possibility comes from Monir’s personal collection and has not been previously shown in public. As with many artists of her time, both she and her work were marked by Iran’s political circumstances and a swathe of her oeuvre was lost in the throes of the 1979 Iranian revolution. Indeed, the works on paper were originally born out of necessity while the artist was deprived of her Tehran studio for a decade after leaving once again for New York when the revolution broke out. In her dedicated workshop, which reopened in Tehran in 2004, Monir works alongside artisans and craftsmen trained in traditional Persian decorative arts and construction including aineh-kari (mirror mosaics) and khatam-kari (inlaid marquetry). After some initial persuasion of the artisans in the 1970s, with some reluctant to take orders from a woman, many of the original craftsmen are dedicated to Monir and remain in her atelier today. In many senses, Monir works in the spirit of old masters. Her Tehran workshop recalls the studios of 17th-century European painters, but also that of the collaborative Persian kitabkhana, which defined the artistic output of the early modern period in Iran. The kitabkhana (literally, ‘the house of books’) was the atelier of artists and craftsmen working in the service of the Persian court in the 1600s. Designs on paper were circulated around craftsmen from different disciplines, including potters, architects, and illuminators working on the borders of manuscripts – so that the same patterns appeared in different media. As with the kitabkhana, Monir’s designs on paper have also informed textiles, sculpture and interior design throughout her career. Monir also has taken both sculptural and architectural commissions from a dedicated pool of patrons. Her large-scale mirror mosaics have iced everything from the Senate building in Tehran to the Dag Hammarskjöld tower in New York. 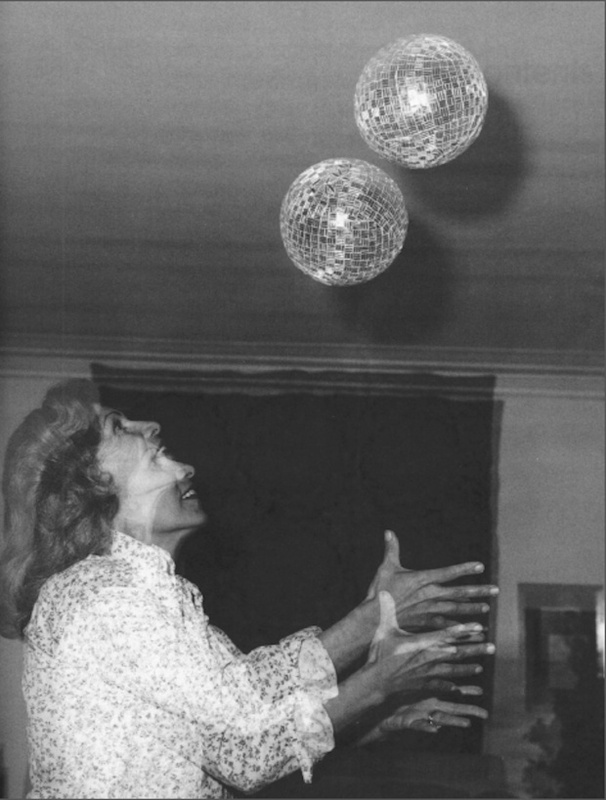 An early version of one of her Mirror Ball (1974) spheres sat on Warhol’s desk: its sparkling siblings are lined up at Serralves in a silent disco. Within Infinite Possibility is an example of her geometric vision in a domestic context. At the end of the exhibition are double doors of frosted glass that she originally fashioned for her New York apartment in the 1980s. A glowing portal, they throw the grey light onto the surrounding walls through interconnected shapes scattered on their translucent surface. Monir’s work fuses the heritage of traditional Iranian craft, particularly that of architectural decoration, with the western philosophies of minimalism and abstraction that informed her friends and contemporaries like Frank Stella and Robert Morris. Geometric, pattern-based abstraction has appeared in Islamic art for thousands of years. A similar aesthetic boomed in Western art during the 1960s, as geometric minimalism became a popular art movement as a measured, rational cousin to the volatility and physicality of abstract expressionism. In both instances, geometric art retains a connection with a scientific and mathematic thought, be it the late ninth-century Persian polymath Omar Khayyam or the modern geometer. The axiomatic coordinates of Farmanfarmaian’s sculptures allows them to tessellate into the “infinite possibilities” that she envisages. An animation in Bahman Kiarostami’s Monir, a documentary film about the artist which had its premier at the Serravles exhibition, shows the six elements of her Convertible Series (Group 8) from 2010, splitting and re-connecting into a kaleidoscopic myriad of combinations. Although Monir’s work resonates with this global dialogue of sixties’ minimalism, her mirror sculptures are not only dimensional but also display a unique animate quality. It was an idea sparked from watching the changing hues play across the glass interior of the Shah Cheragh mosque as people circulated within. Surfaces of her Families (2011-2013) – groups of up to six variations on a single shape, grandly showcased in the second half of Infinite Possibility – are similarly faceted so that “every colour moves”, as the artist explains in the Kirostami documentary: the experience changes each time a visitor is reflected in the work’s surface. The monumental, rotating Square (2014) signals a move into kinetics, where twisting quadrangles are stacked on top of each other, their surface reduced from the signature scattering of mirrored pieces into a single veneer of polished steel. Her method of working is simultaneously intuitive and calculated. In another scene from Monir, which takes place in her workshop, the artist grazes a ruler across a sheet of squared tracing paper, taking a pencil to shade in a grid of lozenges, whilst muttering a chant of “here, here, and here”. There are echoes of automatism in the impulsiveness of her drawing, at odds with the mathematical perfection of her sculpture. In her drawings, so generously laid out at Serralves, scribbled half circles are scattered like confetti over frames of geometric line. Within nets of triangles, rectangles and hexagons, Monir has inserted shards of mirrored glass, working across mediums whilst still employing her artistic vocabulary and compositional principles. Within the Serralves retrospective, Monir’s work begins to occupy a third space, the intersection of an imagined Venn diagram between spheres of sculpture, architecture, painting and draughtsmanship. Works mounted on the walls take their cue from her education as a fine artist on canvass under the tutelage of the American modernist painter Milton Avery in the 1950s. In her most recent drawings, delicate petals and blooms have begun to creep in, making flowerbeds within her famous hexagons and undulating semi-circles. These motifs mark a return to softer elements plucked from the beginning of her artistic career, where she created still lives of flowers, department store illustrations and monotype prints – an endeavour which won her a medal at the 1958 Venice Biennale. Her always untitled sketches provide a greater scope for her experimentally. As the fine, calligraphic line used to conjure the blossoms increasingly intermingles with the graphic solidity of shape, the designs on paper would present a sculptural impracticality. One begins to realise that these drawings are, as Cotter says, more than potential brainstorms for large-scale works; they are drawings for drawing’s sake. The textures within her works on paper explore the infinite possibilities that drive her practice even further than before, and are shown in compelling independence at this exhibition. After having made art for more than 70 years, Monir Shahroudy Farmanfarmaian is still very much a practitioner. After Porto, the exhibition will be travelling to Monir’s second home, with a showing at the Solomon R. Guggenheim Museum in New York opening in March.